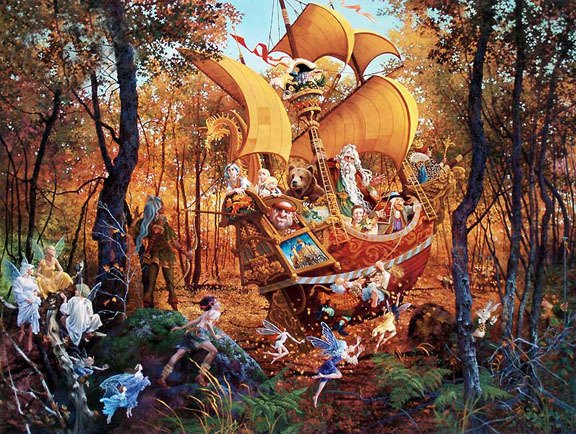 Hoist the sails, seize the tiller-you're off to wild and distant shores, where tales of imagination still roam free! We're sure you recognize the woolly bearded captain of the Fablemaker-he was the magical bard of Christensen's phenomenally popular sold out limited edition print Once Upon a Time. In that image, the bard enthralled a gathering of fairy folk with exciting human fables. Now, to celebrate the 10th anniversary release of that print, those old friends and new have skippered the Fablemaker in search of far-off legends. A lifeline trails, it's within your reach-swing aboard and join the crew!